Shavua tov, chag sameach, and looking forward to Shabbat Shemini (1)! Shavua tov — a good new week to you. And chag sameach, happy festival of Passover to all! I hope that everyone’s sedarim were high and sweet. This is the first week of the Omer, the week of chesed (lovingkindness.) Here are 49 poems for the Omer. There are a bunch of good Omer-counting apps to help us remember to count and to reflect on the qualities we’re invited to cultivate each day; I recommend MyOmerCounter and the Omer app from NeoHasid. 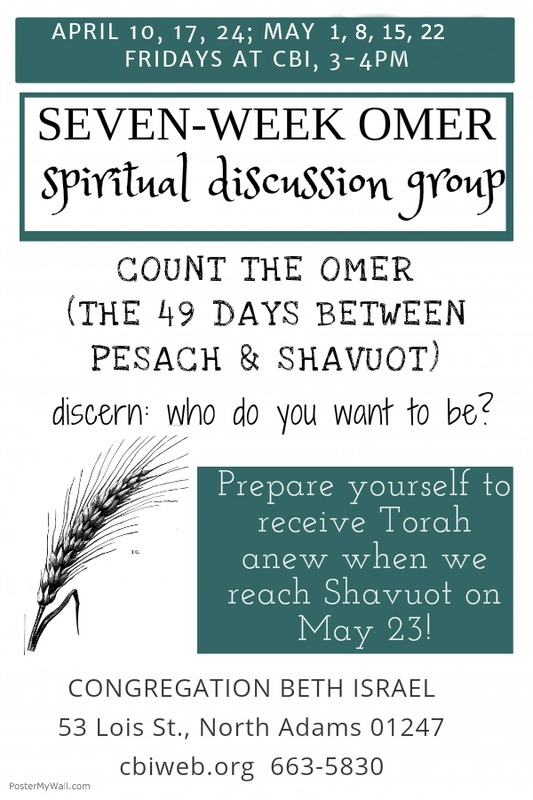 The 49 days of the Omer count lead us from second seder to Shavuot. During these seven weeks, we prepare ourselves to receive Torah anew. I hope you’ll join us at our Hudson Valley Shavuot Retreat on May 18-20 at the end of the Omer count — read all about it and register now! Shavua tov! Looking forward to the remainder of Pesach and to a bar mitzvah. Shavua tov – a good week to you! And chag sameach, a joyous festival. I hope that everyone’s Pesach has begun with sweetness. CBI is both part of the ALEPH Network, and affiliated with the Union for Reform Judaism. As a Reform-affiliated community, we observe seven days of Pesach. (All communities in Israel do the same. Outside of Israel, Conservative and Orthodox communities observe eight days of Pesach… but at CBI for the last several years we have followed Reform custom of observing a seven-day festival of Passover.) Therefore, following Reform custom, we’ll divide the Torah portion Acharei Mot into two halves, and will read from the first half this coming Shabbat as we celebrate the bar mitzvah of Jeremy Guy, and from the second half the following week. May this week of Pesach be meaningful and sweet for all of us! As we move from Pesach to Shavuot, we enter into the journey of counting the Omer — the days which connect our festival of liberation with our festival of revelation. If you’re looking for Omer-counting resources, there are a few more copies of Rabbi Rachel’s Toward Sinai: Omer Poems available at the synagogue. There are also a variety of places online where one can sign up for daily Omer teachings via email or Facebook — I especially like the Omer teachings at A Way In at Mishkan Shalom. 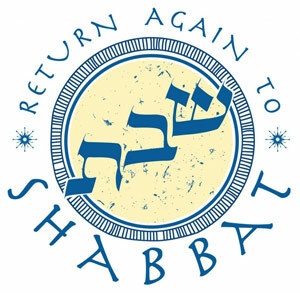 Don’t forget to register for the Shavuot retreat at Isabella Freedman! As members of an ALEPH Network community we receive a substantial discount; include the registration code VELVETEEN and you’ll get a $150 discount on that retreat. Today is the first day of the Omer — the 49 days between Pesach and Shavuot, between liberation and revelation. Jewish tradition offers us these seven weeks as a time for the spiritual work of discernment, refinement, and inner growth. Our Omer discussion group will meet every Friday at 3pm during this holy corridor of time. (Read all about it.) All are welcome. May these weeks of the Omer yield an abundant harvest of wisdom and insight for all of us. “The Egyptian sky / was a goddess / doing a backbend” — one of the deities in the Egyptian pantheon was Nut, sometimes depicted as a star-covered woman arching over the earth. “[T]he heavens / became sapphire floor / beneath the throne” — see parashat Mishpatim and its description of the floor beneath the divine throne as being like sapphire. The idea of the sky changing as the prevailing beliefs change also owes a debt to Elizabeth Bear’s Eternal Sky books. As I write these words Pesach is almost upon us. I can’t wait! At our second-night seder we’ll begin a seven-week journey known as the Counting of the Omer. We count the 49 days between Pesach and Shavuot, linking liberation with revelation. Once these were the weeks during which we grew our spring wheat harvest to bring to the Temple in Jerusalem; today these are weeks during which we nurture and nourish an internal harvest of personal and spiritual growth. I hope you’ll join us on Fridays at 3pm in my office for our Omer discussion group. All are welcome. Rabbi T’mimah Ickovitz has the custom of sharing a daily teaching or inspiration related to the Omer count at Holistic Jew (Facebook), and is sharing new ones this year during the Omer. Rabbi Goldie Milgram will be offering daily Omer teachings online at ReclaimingJudaism.org. Joy Krauthammer adds writing and art to her Omer website each day of the Omer. Brian Yosef Schachter Brooks is offering an online meditation class, with an in-person Omer component, as a fundraiser for ALEPH. Read all about it: Jewish meditation e-course. May these various offerings enrich these next seven weeks and help all of us journey toward Shavuot with mindfulness, discernment, and joy! Pesach is approaching! And after Pesach comes the seven-week period called the Omer, the 49 days which we count between Pesach and Shavuot. This is a very special time of year, which our tradition sets apart as a season for inner work, discernment, and cultivating the qualities which will help us to be ready to receive Torah at Sinai anew on Shavuot.